This painting by Franz Roubaud illustrates an episode near the Askerna river where the Russians managed to repel attacks by a larger Persian army for two weeks. They made a "living bridge", so that two cannons could be transported over their bodies. Persia is forced to cede what is now Georgia, Dagestan, most of Azerbaijan, and parts of northern Armenia to Russia. The 1804–1813 Russo-Persian War, was one of the many wars between the Persian Empire and Imperial Russia, and began like many of their wars as a territorial dispute. The new Persian king, Fath Ali Shah Qajar, wanted to consolidate the northernmost reaches of his kingdom—modern day Georgia—which had been annexed by Tsar Paul I several years after the Russo-Persian War of 1796. 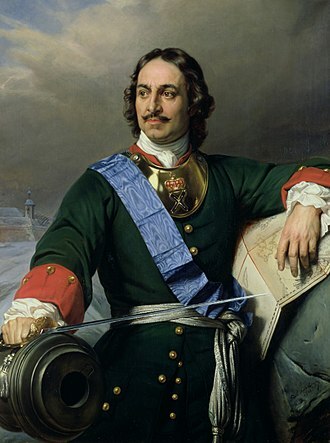 Like his Persian counterpart, the Tsar Alexander I was also new to the throne and equally determined to control the disputed territories. The war ended in 1813 with the Treaty of Gulistan which ceded the previously disputed territory of Georgia to Imperial Russia, and also the Iranian territories of Dagestan, most of what is nowadays Azerbaijan, and minor parts of Armenia. 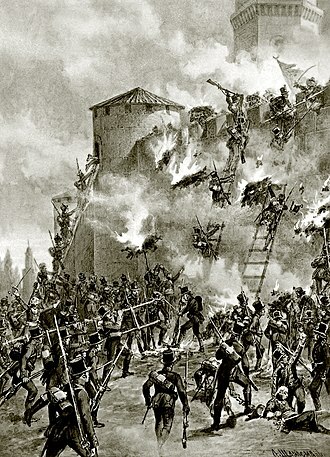 The siege of Ganja Fortress in 1804 during the Russo-Persian War (1804-1813) by the Russian forces under leadership of general Pavel Tsitsianov. The origins of the first full scale Russo-Persian War can be traced back to the decision of Tsar Paul to annex Georgia (December 1800) after Erekle II, who had been appointed as ruler of Kartli several years earlier by his ruler Nader Shah, made a plea to Christian Russia in the Treaty of Georgievsk of 1783 to be incorporated into the empire. 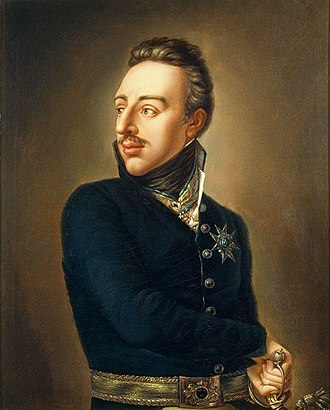 After Paul's assassination (11 March 1801), the activist policy was continued by his successor, Tsar Alexander, aimed at establishing Russian control over the khanates of the eastern Caucasus. In 1803, the newly appointed commander of Russian forces in the Caucasus, Paul Tsitsianov, attacked Ganja and captured its citadel on 15 January 1804. Ganja's governor, Javad Khan Qajar, was killed, and a large number of the inhabitants slaughtered. The Qajar ruler, Fath Ali Shah, saw the Russian threat to Armenia, Karabagh, and Azerbaijan not only as a source of instability on his northwestern frontier but as a direct challenge to Qajar authority. The Russians were unable to commit a large portion of their troops to the Caucasus region, because Alexander's attention was continually distracted by simultaneous wars with France, the Ottoman Empire, Sweden and Great Britain. Therefore, the Russians were forced to rely on superior technology, training, and strategy in the face of an overwhelming disparity in numbers. Some estimates put the Persian numerical advantage at five to one. Shah Fath Ali's heir, Abbas Mirza, tried to modernize the Persian army, seeking help from French experts through the Franco-Persian alliance, and then from British experts, in order to address the tactical disparity between the forces. The war began when Russian commanders Ivan Gudovich and Paul Tsitsianov attacked the Persian settlement of Echmiadzin, the most holy town in Armenia. Gudovich, unsuccessful in the siege of Echmiadzin due to a lack of troops, withdrew to Yerevan, where his siege again failed. Despite these ineffective forays, the Russians held the advantage for the majority of the war, due to superior troops and strategy. 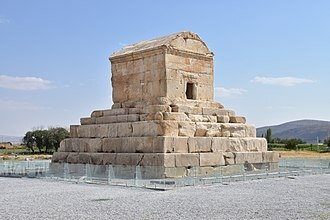 Russia's inability, however, to dedicate anything more than 10,000 troops to the campaign allowed the Persians to mount a fairly respectable resistance effort. The Persian troops were of a low grade, mostly irregular cavalry. The Persians scaled up their efforts late in the war, declaring jihad, or holy war, on Imperial Russia in 1810. Russia's superior technology and tactics ensured a series of strategic victories. Despite the Persian alliance with Napoleon – who was the ally of Persia's Abbas Mirza, France could provide little concrete direct help. Even when the French were in occupation of the Russian capital, Moscow, Russian forces in the south were not recalled but continued their offensive against Persia, culminating in Pyotr Kotlyarevsky's victories at Aslanduz and Lenkoran, after the setback in the Battle of Sultanabad in 1812 and 1813 respectively. Upon the Persian surrender, the terms of the Treaty of Gulistan ceded the vast majority of the previously disputed territories to Imperial Russia. This led to the region's once-powerful khans being decimated and forced to pay homage to Russia. During this period Russia was mainly dealing with the local khanates which were subject to Persia. Following the bloody capture of Ganja the khans could usually be bullied without too much fighting. The main Persian army intervened twice, once successfully and once unsuccessfully. Main events were: 1804: Capture of Ganja and failure to take Yerevan; 1805: push east almost to the Caspian; 1806: death of Tsitsianov, capture of the Caspian coast and start of the Russo-Turkish War. In late 1803 Pavel Tsitsianov demanded the submission of the Ganja Khanate southeast of Georgia, over which Georgia had some nominal claims. He was now no longer unifying Georgia or liberating Christians but moving against territory that was clearly Muslim and Persian. On 3 January 1804 Ganja was taken with a good bit of slaughter. Abbas Mirza’s army arrived too late and retired south. In June Tsitsianov and 3000 men marched south toward Echmiadzin in the Yerevan Khanate. They were driven back by Abbas Mirza and 18000 Persians (?). They then moved east and besieged Yerevan (July–September). The local khan held the citadel, the Russians held the town and the Persians held the surrounding countryside. Weakened by disease and fighting on half-rations, the Russians withdrew to Georgia, losing more men along the way. In early 1805 the Shuragel Sultanate was taken. This was a small area at the junction of Georgia, the Yerevan Khanate and Turkey and included the militarily important town of Gyumri. On 14 May the Karabakh Khanate and on 21 May the Shaki Khanate submitted. In response to the loss of Karabakh Abbas Mirza occupied the Askeran Fortress at the mouth a valley that leads from the plain southwest to Shusha, the capital of Karabakh. The Russians responded by sending Koryagin to take the Persian fort of Shakh-Bulakh. Abbas Mirza marched north and besieged the place. On hearing of the approach of another army under Fath Ali Koryagin slipped out at night and headed for Shusha. He was caught at the Askeran gorge but not defeated. More Russian troops relieved the blockade of Koryagin and Shusha. Seeing that the main Russian force had pushed far to the southeast, Abbas Mirza made a wide swing north and besieged Ganja. On 27 July 600 Russian infantry routed his camp at Shamkir. In September a naval attack on Baku failed. In November Tsitsianov marched east toward Baku, en route accepting the submission of the Shirvan Khanate (27 December). On 8 February 1806 he was murdered while accepting the surrender of Baku. 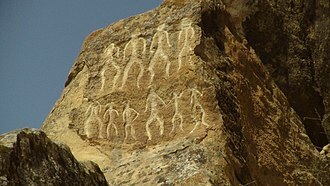 Russian honor was retrieved by Glazenap who marched from north of the mountains and took Derbent, Quba and Baku. (Strictly Baku surrendered to Bulgakov.) Gudovich replaced Tsitsianov as Viceroy. In December Turkey declared war on Russia. Troops were moved west to deal with the Turks, a truce was made and Nibolshin was left to guard the frontier. Fighting resumed in 1808 when Russia took Echmiadzrin. Abbas Mirza was defeated south of Lake Shirvan and Nakhichevan, or some part of it, was occupied. In September 1808 Gudovich attacked Yerevan. The assault failed, withdrawal became necessary and 1000 men, mostly sick and wounded, froze to death on the retreat. Escape was only possible because Nibolshin and Lissanevich defeated a ‘vast horde’ of Persians. Gudovich resigned and was replaced by Alexander Tormasov. In 1809 Fath Ali was driven back from Gyumri and Abbas Mirza from Ganja. In 1810 Abbas Mirza tried to invade Karabakh but was defeated at Meghri on the Aras River. In early 1812 Persia invaded Karabagh. They occupied Shakhbulakh which the Russians regained. They attacked a Russian battalion at ‘Sultan-Buda’ using European-style infantry and a few British officers. After a day of fighting the Russians surrendered. Russia responded to this unusual defeat by moving Pyotr Kotlyarevsky, the hero of Akhalkalaki, from the Turkish to the Persian front. In the summer of 1812, just as Napoleon was preparing to invade, Russia made peace with Turkey and its Caucasian troops turned to Persia. 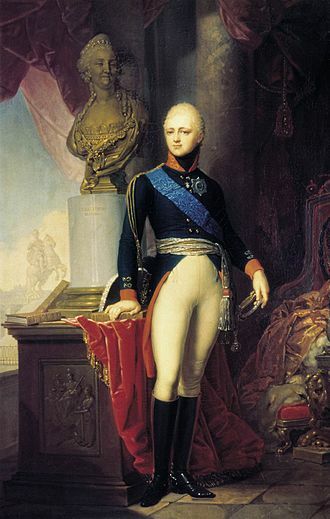 On 19 October Kotlyarevsky ignored the cautious Ritishchev's orders, crossed the Aras River, and routed the Persians at the Battle of Aslanduz. He then crossed the snow-covered Mugan Plain and after a five-day siege stormed the new-built fort of Lenkaran. The Russians lost 1000 men, two thirds of their force. Of the 4000-man garrison, every survivor was bayonetted. Kotlyarevsky was found wounded among a heap of corpses. He was carried half-dead to Tiflis and survived for 39 more years, unfit for further service. A victory at ‘Karabezouk’ completed the discomfiture of the Persians (3 April 1813). 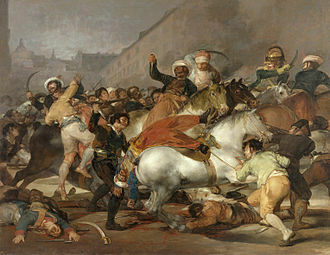 News of Napoleon's defeat reached Persia in the spring of 1813. Peace negotiations were already underway and an armistice was made in October. By the Treaty of Gulistan Persia recognized Russian possession of all the Khanates it held and gave up all pretensions to Dagestan and Georgia. The border in the northern part of Talysh was left for later decision. Persia kept Meghri in southwest Karabakh which the Russians had abandoned as unhealthy and inaccessible from the rest of Karabakh. Thirteen years later, in the Russo-Persian War (1826–28), Persia tried to regain its territory. It was defeated and lost the Khanates of Yerevan and Nakhichevan, roughly modern Armenia. The Iranian Envoy Mirza Mohammed Reza-Qazvini meeting with Napoleon I at the Finckenstein Palace, 27 April 1807, to sign the Treaty of Finckenstein. This opened the door for France to use Persia to threaten both Russian and British interests. Hoping to forge a tripartite alliance of France, the Ottoman Empire, and Persia, Napoleon sent various envoys to Persia, notably Pierre Jaubert and Claude Mathieu de Gardane, whose diplomatic efforts culminated in the Treaty of Finckenstein, signed on 4 May 1807, under which France recognized Persian claims to Georgia and promised assistance in training and equipping the Persian army. 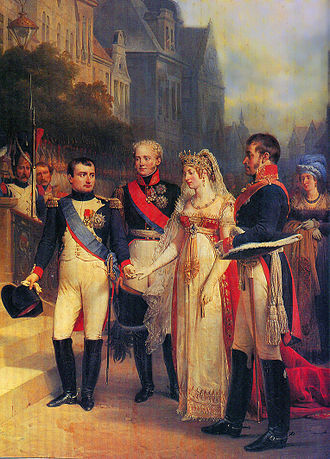 Only two months later, however, Napoleon and Alexander I agreed to an armistice and signed the Treaty of Tilsit (7 July 1807), which effectively rendered the French commitments to Persia untenable, although the French mission did continue to provide some military assistance and tried to mediate a settlement with Russia. The French efforts failed, prompting Gudovich to resume the siege of Erevan in 1808. The rise of French influence in Persia, viewed as the prelude to an attack on India, had greatly alarmed the British, and the Franco-Russian rapprochement at Tilsit conveniently provided an opportunity for a now isolated Britain to resume its efforts in Persia, as reflected in the subsequent missions of John Malcolm (1807–8) and Harford Jones (1809). According to the preliminary treaty of Tehran arranged by Jones (15 March 1809), Britain agreed to train and equip 16,000 Persian infantry and pay a subsidy of £100,000 should Persia be invaded by a European power, or to mediate if that power should be at peace with Great Britain. Although Russia had been making peace overtures, and Jones had hoped the preliminary agreement would encourage a settlement, these developments strengthened Fath Ali Shah ’s determination to continue the war. Anglo-Persian relations warmed even further with the visit of Abu’l-Hasan Khan to London in 1809 and his return to Persia with Gore Ouseley as ambassador and minister plenipotentiary in 1810. Under Ouseley's auspices, the preliminary treaty was converted into the Definitive Treaty of Friendship and Alliance in 1812, which confirmed the earlier promises of military assistance and increased the amount of the subsidy for that purpose to £150,000 . Then, in the third and final twist to this story, Napoleon invaded Russia in June 1812, making Russia and Britain allies once again. Britain, like France after Tilsit, was thus obliged to steer a course between antagonizing Russia and violating its commitments to Persia, with its best option being to broker a settlement of the conflict between the two. The Russians had been periodically interested in finding a negotiated settlement since the setbacks of 1805–6 and as recently as 1810, when Alexander Tormasov, who had replaced Gudovich as commander after his unsuccessful siege of Erevan, and Mirza Bozorg Qaem-magham had sought to arrange an armistice . Yet the Russians were unwilling to make serious concessions in order to end the war, and the Persians were also less than eager to settle since from their point of view the war was not going all that badly. Ouseley, however, realized the awkwardness of having Britain's resources deployed against its Russian ally and that the situation for Persia was likely to worsen once Russia was freed from the struggle with Napoleon. He was thus receptive to Russian requests to act as an intermediary and sought ways to pressure the Qajars into accepting a settlement. He proposed revisions to the Definitive Treaty, scaled back British military involvement (leaving two officers, Charles Christie and Lindesay Bethune, and some drill sergeants with the Persian army), and threatened to withhold payment of the subsidy promised to the Qajars . 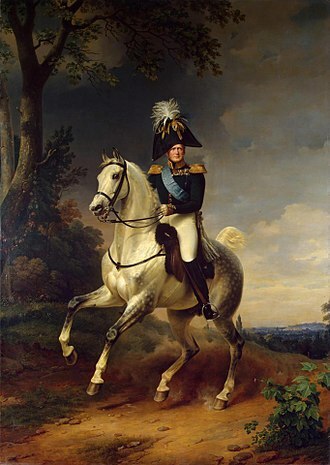 In February 1812, N. R. Ritischev assumed command of the Russian forces and opened peace negotiations with the Persians. Ouseley and his representative at the talks, James Morier, acted as intermediaries and made various proposals to Rtischev, but they were not accepted . In August, Abbas Mirza resumed hostilities and captured Lankaran. After news arrived that Napoleon had occupied Moscow, the negotiations were suspended (Ramażān 1227/September 1812). Then, on 24 Shawwal 1227/31 October 1812, while Ritischev was away in Tbilisi, the general Peter Kotliarevski launched a surprise night attack on the Persian encampment at Aslanduz, which resulted in the complete rout of the army of Abbas Mirza and the death of one of the British supporting officers (Christie). 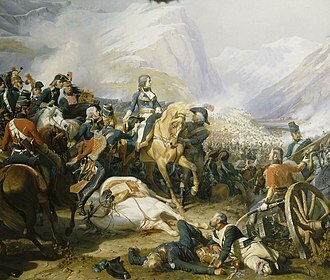 As it also became increasingly apparent that Napoleon's offensive in Russia had failed disastrously, the Russians were emboldened to pursue a more aggressive campaign in the Caucasus. 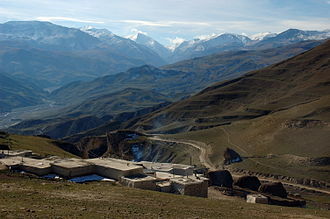 In early 1813, the Persian fortress at Lankarān fell and its garrison was annihilated, enabling the Russians to occupy most of Talesh again . Although Fath Ali Shah and Abbas Mirza wanted to fight on after these setbacks, they eventually had to yield to Ouseley, who assured the Shah that either the Russians would make territorial concessions or the British would continue the subsidy they had promised. 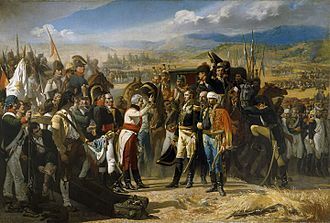 Russia fought in two frontiers – with Ottoman between 1806 and 1812, and with Persian from 1804 to 1813 – and the wars were ended consecutively by treaties: the treaty of Bucharest in 1812 with Ottoman Empire, and the treaty of Gulistan in 1813 ended the Russian-Persian conflict for a while. Under this treaty, Russia was acknowledged as the power controlling South Caucasus; western and eastern Georgia and Muslim khanates till Baku and Quba was under Russian control and administration. 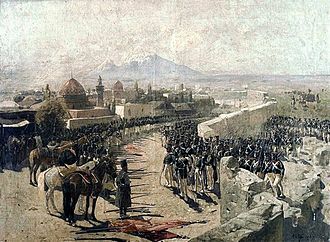 Controlling the administration of Caucasus, Russia was recognized as a power over Caucasus, yet the success of treaty of Gulistan was overshadowed with the Ottoman threat. Treaty of Bucharest was in favor of Ottoman Empire, that gained the territories Russia conquested during the time of war: Poti and Anapa, Black Sea port cities as well as Akhalkalaki. Still, the conditions of sovereignty comparatively stabile in these years, in the complex political map of South Caucasus, Russia had the means to control the region through defensive lines. ^ Goldstein, Erik (1992). Wars and Peace Treaties: 1816 to 1991. London: Routledge. p. 67. ISBN 0-415-07822-9. ^ Dowling, Timothy C. (2014). Russia at War: From the Mongol Conquest to Afghanistan, Chechnya, and Beyond. Santa Barbara: ABC-Clio. pp. 728–29. ISBN 1-59884-948-4. ^ a b Daniel, Elton L. "Golestān Treaty". Encyclopædia Iranica. Retrieved 6 November 2011. ^ Fisher et al. 1991, pp. 334. N. Dubrovin. История войны и владычества русских на Кавказе, volumes 4–6. SPb, 1886–88. Fisher, William Bayne; Avery, P.; Hambly, G. R. G; Melville, C. (1991). The Cambridge History of Iran. 7. Cambridge: Cambridge University Press. ISBN 0521200954. The peace negotiations were precipitated by Lankarans fall to Gen. Pyotr Kotlyarevsky on 1 January 1813. The treaty confirmed the ceding and inclusion of what is today Daghestan, most of the Republic of Azerbaijan, the text was prepared by the British diplomat Sir Gore Ouseley who served as the mediator and wielded great influence at the Persian court. It was signed by Nikolai Rtischev from the Russian side and Mirza Abolhassan Khan Ilchi from the Persian side, by 1828, Iran had lost, through the Gulistan and Turkmenchay treaties, all its aforementioned integral territories in Transcaucasia and the North Caucasus. Out of the part of the territory, three separate nations would be formed through the dissolution of the Soviet Union in 1991, namely Georgia, Azerbaijan. Lastly and equally important, as a result of Russias imposing of the two treaties, it decisively parted the Azerbaijanis and Talysh ever since between the two nations. Imperial Russia had just sworn in a new tsar, Alexander I, in 1801, a few years previously in Persia, Fath Ali Shah Qajar became the new shah after the assassination of his uncle, Mohammad Khan Qajar in 1797. By the events prior and after the Battle of Krtsanisi of 1795, he had regained control again over Eastern Georgia, Armenia. 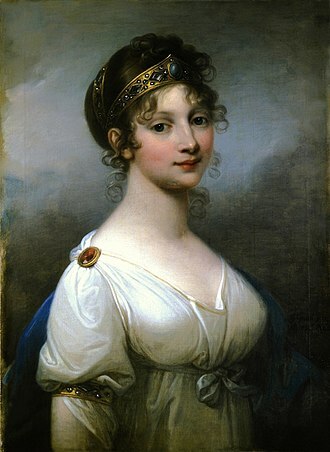 Persia was trying to align with France in 1801 to better position itself in case of war with Russia, with the alliance, Persia entered into the first Russo-Persian War against a militarily pre-occupied Russia, which was heavily invested in the Napoleonic Wars. Numerically, Persian forces had an advantage during the war. 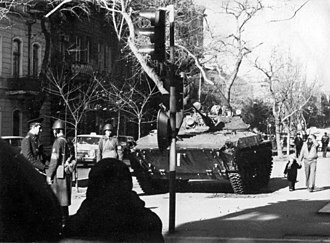 However, the Persian forces were technologically backwards and poorly trained - a problem that the Persian government did not recognize until a far juncture, despite these crippling disadvantages, fighting continued in northern Persia, Azerbaijan and in regions of Georgia. Persia was so enraged at Russia as to declare a jihad upon them, Persia further abandoned all pretensions to Daghestan, Mingrelia and Abkhazia. Both countries agree on the establishment of trade, with Russians having free access to conduct business anywhere in Iran. Iran is complete and free access to Russia, yet both must pay a 5% ad valorem tax on any items imported into each respective country. The Battle of Sultanabad occurred on February 13,1812, between the Russian Empire and Persian Empire. In the resulting battle, the Russians were routed, the Persians, numerically superior, were led by Abbas Mirza and fought the Russians led by Pyotr Kotlyarevsky. A Persian offensive into Georgia, with their British and French trained Nezam-e Jadid infantry, the Persians had obtained European cannons from the French. The Persians won the battle by moving faster than the Russians, although this was a minor victory for the Persians, Abbas Mirza tried to show it as a major victory. In the end however the Persians lost the invasion due to the Russian maneuvring around the Aras River which culminated in the Battle of Aslanduz, the Persians would have given up had it not been for the news of Napoleons invasion of Russia in the spring. War and Peace in Qajar Persia, Implications Past and Present, ISBN 978-0-415-42119-5 Journal of the British Institute of Persian Studies, Volume 36, Tehran Author, Article Title, page numbers needed Atkin, Muriel. Transcaucasia, or the South Caucasus, is a geopolitical region in the vicinity of the southern Caucasus Mountains on the border of Eastern Europe and Western Asia. Transcaucasia roughly corresponds to modern Georgia and Azerbaijan, Transcaucasia and Ciscaucasia together comprise the larger Caucasus geographical region that divides Eurasia. All of present-day Armenia is in Transcaucasia, the majority of present-day Georgia and Azerbaijan, including the exclave of Nakhchivan, parts of Iran and Turkey are included within the region of Transcaucasia. Goods produced in the region include oil, manganese ore, citrus fruits and it remains one of the most politically tense regions in the post-Soviet area, and contains three heavily disputed areas, South Ossetia, and Nagorno-Karabakh. Between 1878 and 1917 the Russian controlled province of Kars Oblast was incorporated into the Transcaucasus, Transcaucasia is a Latin rendering of the Russian-language word zakavkazie, meaning the area beyond the Caucasus Mountains. This implies a Russian vantage point, and is analogous to similar terms such as Transnistria and Transleithania, other forms of this word include Trans-Caucasus and Transcaucasus. 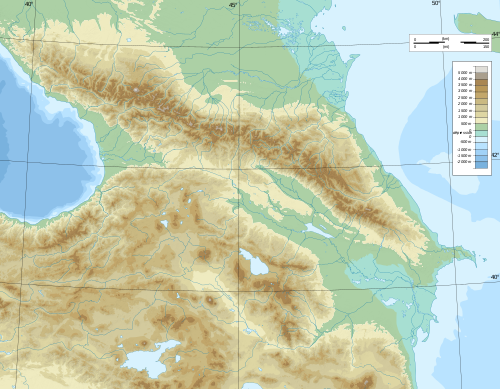 The region is referred to as Southern Caucasia and the South Caucasus. Located on the peripheries of Turkey and Russia, the region has been an arena for political, religious, throughout history, Transcaucasia was usually under the direct rule of the various in-Iran based empires and part of the Iranian world. In the course of the 19th century, Qajar Iran had to cede the region as a result of the two Russo-Persian Wars of that century to Imperial Russia. Ancient kingdoms of the region included Armenia and Iberia, the Orthodox Christian Kingdom of Georgia dominated most of Transcaucasia. The region was conquered by the Seljuk, Turkic, Ottoman, Afsharid. The 1826-1828 conquerings were confirmed in the 1828 Treaty of Turkmenchay, in 1801, what is now Georgia was formally incorporated into the Russian Empire. After 1828-1829 war, Ottomans ceded Western Georgia except Adjaria, which was known as Sanjak of Batum, finally after Russo-Turkish War, Russians completed conquest of Transcaucasus. Jafar al-Javad Khan Ziyad oghlu Qajar was the last khan of Ganja khanate from 1786 to 1804. Javad Khan was a son of Shahverdi Khan and brother of Rahim Khan, Javad Khan succeeded his brother on Rahim Khans deposition through Azerbaijan intervention in 1786. Alike the ruling Iranian dynasty of Turkic origin, which ruled Persia from 1785 to 1925 and he was a member of the Qajar tribe. With the accession to power, Javad Khan faced a threat from Georgia, in September 1787, a combined Georgia and Russian army under the command of Colonel Burnashev marched to Ganja, but the ongoing Russo-Turkish war forced the allies to withdraw. A fragile peace ensued and the Georgia king Erekle II granted Javad Khan control over Shamshadilu, in early 1789 Erekle II, now allied with Fath Ali Khan of Quba and Muhammad Hasan Khan of Shaki, attacked Ganja and Javad Khan had to abandon his capital without fighting. After three months, Fath Ali Khan died and Javad was able to resume his reign and his political orientation was pro-Iranian that brought him in conflict with Georgia and Russia. In 1795, Javad Khan of Ganja joined the Iranian expedition against Georgia, Erekle II retaliated by blockading Ganja in 1796, but the khan of Karabakh brokered peace. In September 1796 Ganja was temporarily occupied by the Russian general Valerian Zubov during his Persian Expedition of 1796, during the first Russo-Persian War, Ganja was considered by Russians as a town of foremost importance. General Pavel Tsitsianov approached Javad khan several times asking him to submit to Russian rule, in November 1803, the Russian army moved from Tiflis and in December, Tsitsianov started the siege preparations. After heavy artillery bombardment, on January 3,1804, Tsitsianov gave the order to attack the fortress, during the fierce fighting, Armenians residing in the city open the gates of the castle and, as a results, the Russians were able to capture the fortress. Javad khan was killed, together with his sons at war, some members of his family were able to escape to Tabriz, while others remained in Ganja. The Storming of Lankaran took place on 1 January 1813 as part of the Russo-Persian War. 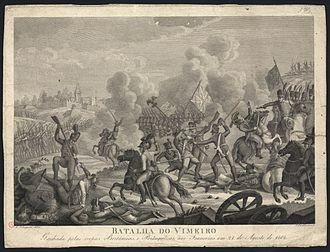 It was noted for its bitterness and cruelty, after a siege of five days, which included the shelling of the place, the Russians managed to storm the citadel, despite a Persian numerical superiority. Though suffering heavy losses in the siege during which most of the officers and non-commissioned officers were killed, after having taken the fortress, all survivors were murdered by the Russians and none were taken captive. Of the besieging Russian 17th Jaeger regiment consisting of 296 people only 74 of them survived the battle, in the course of the ongoing Russo-Persian War, the British managed to build a strong fortress in Lankaran. According to eyewitnesses she made an impression by high stone walls. Furthermore, the citadel was surrounded by deep trenches and it had a shape of an irregular quadrilateral, with the left bank of the river Lankaranki, which is situated not far from the Caspian Sea, in the marshes nearby the citadel. Most of the southwest side stretched up for up to 130 meters long, the length of the northeast side, built in the shape of an irregular polygon, stretched up to 80 meters. The south-east side and from the northwest (from the front to the villages of Gamushevani were 100 meters long each, besides that, on each corner were bastions located. The most imposing of them were the ones from the northeastern side, the ditch in front of the citadel was 4 meters deep and 10 meters in width. After crossing swamps and marshes, the soldiers were transferred to a weather of terrible snow. By that time, his army had undergone a heavy need for resupplies especially drinking water, on December 20, Russian detachment came across Shahsevan which were made often to flee and partly captured. 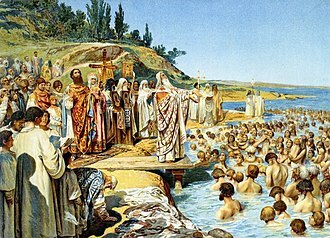 By December 21, Kotlyarevskys squad had reached the Talysh Khanate where they encountered 500 Persian horsemen, the horsemen and Abusalema evaded combat and retreated to Arkivan. Subsequently, the Russian avant-garde met the cavalry sardar Pir-Quli-Khan and a detachment of 1000 Persian soldiers, after a brief exchange of fire, the retreating Persians were pursued by Cossacks. The Qajar dynasty was an Iranian royal dynasty of Turkic origin, specifically from the Qajar tribe, which ruled Persia from 1785 to 1925. The state ruled by the dynasty was known as the Sublime State of Iran. The Qajar family took control of Iran in 1794, deposing Lotf Ali Khan, the last of the Zand dynasty. In the Caucasus, the Qajar dynasty permanently lost many of Irans integral areas to the Russians over the course of the 19th century, comprising modern-day Georgia, Dagestan and Armenia. The Qajar rulers were members of the Karagöz or Black-Eye sect of the Qajars, Qajars first settled during the Mongol period in the vicinity of Armenia and were among the seven Qizilbash tribes that supported the Safavids. The Safavids left Arran to local Turkic khans, and, in 1554 Ganja was governed by Shahverdi Soltan Ziyadoglu Qajar, Qajars filled a number of diplomatic missions and governorships in the 16–17th centuries for the Safavids. The Qajars were resettled by Shah Abbas I throughout Iran, the great number of them settled in Astarabad near the south-eastern corner of the Caspian Sea, and it would be this branch of Qajars that would rise to power. The immediate ancestor of the Qajar dynasty, Shah Qoli Khan of the Quvanlu of Ganja and his son, Fath Ali Khan was a renowned military commander during the rule of the Safavid shahs Sultan Husayn and Tahmasp II. He was killed on the orders of Shah Nader Shah in 1726, Fath Ali Khans son Mohammad Hasan Khan Qajar was the father of Mohammad Khan Qajar and Hossein Qoli Khan, father of Baba Khan, the future Fath-Ali Shah Qajar. 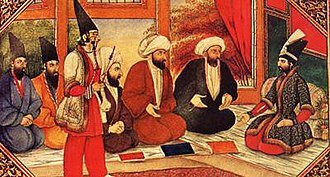 Mohammad Hasan Khan was killed on the orders of Karim Khan of the Zand dynasty, like virtually every dynasty that ruled Persia since the 11th century, the Qajars came to power with the backing of Turkic tribal forces, while using educated Persians in their bureaucracy. In 1779 following the death of Karim Khan of the Zand dynasty, Mohammad Khan Qajar, Mohammad Khan was known as one of the cruelest kings, even by the standards of 18th century Iran. In his quest for power, he razed cities, massacred entire populations, the Qajar armies at that time were mostly composed of Turkomans and Georgian slaves. The Republic of Dagestan, spelled Daghestan, is a federal subject of Russia, located in the North Caucasus region. Its capital and largest city is Makhachkala, located at the center of Dagestan on the Caspian Sea. With a population of 2,910,249, Dagestan is very diverse and Russias most heterogeneous republic, with none of its several dozen ethnicities. Largest among these ethnicities are the Avar, Kumyk, Laks, Tabasaran, ethnic Russians comprise about 3. 6% of Dagestans total population. Russian is the official language and the lingua franca among the ethnicities. Dagestan has been a scene of Islamic insurgency, occasional outbreaks of separatism, according to International Crisis Group, the militant Islamist organization Shariat Jamaat is responsible for much of the violence. The word Dagestan is of Turkish and Persian origin, dağ means mountain in Turkish and -stan is a Persian suffix meaning land. Some areas of Dagestan were known as Albania, the name Dagestan referred to Dagestan Oblast during 1860 to 1920, corresponding to the southeastern part of the present-day Republic. It is the southernmost part of Russia, and is bordered on its side by the Caspian Sea. Major rivers include, Sulak River Samur River Terek River Vladas River Ccenter River Dagestan has about 405 kilometers of coast line on the Caspian Sea, most of the Republic is mountainous, with the Greater Caucasus Mountains covering the south. The highest point is the Bazardüzü/Bazardyuzyu peak at 4,470 meters on the border with Azerbaijan, the southernmost point of Russia is located about seven kilometers southwest of the peak. 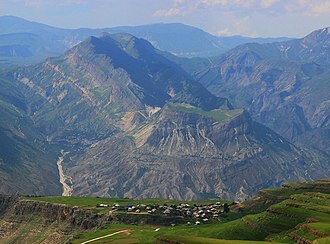 Other important mountains are Diklosmta, Gora Addala Shukgelmezr and Gora Dyultydag, Dagestan is rich in oil, natural gas and many other minerals. The climate is hot and dry in the summer but the winters are harsh in the mountain areas, Average January temperature, +2 °C Average July temperature, +26 °C Average annual precipitation,250 to 800 mm. Dagestan is administratively divided into forty-one districts and ten cities/towns. The districts are subdivided into nineteen urban-type settlements, and 363 rural okrugs. In 1803, the newly appointed commander of Russian forces in the Caucasus, Paul Tsitsianov, attacked Ganja. And both vowed to fulfill his promises, the 14th in January 1804, the Russian council of war decided to do, Be the assault the next day. The other two towers were one by one by major Lisanevich. Khans death brought confusion into the ranks of the defenders, but they showed resistance. The city at time was in a terrible confusion. Crowds of the people, on horse and foot, rushed in disorder on the streets, bewildered residents hid in their homes and barns, women filled the air with frantic cries. Meanwhile, Russian soldiers with bayonets cleared the street, entirely covered with dead bodies, and seized the booty, finding on a horseback some precious gold jewelry. By noon the battle began to subside, and broke again only for a moment when, according to Tstsianov, the soldiers came upon five hundred men, who have entrenched themselves in the Juma mosque. The elder son of Javad Khan, Hossein Quli khan, was killed during the battle. Tsitsianov who unified Georgia and won most of Transcaucasia for Russia. King George XII was the last king of Kartli and Kakheti, which was annexed by Russia in 1801. The old town of Derbent, a World Heritage Site. Prince Abbas Mirza, signed by L. Herr, dated 1833. General Gardane, with colleagues Jaubert and Joanin, at the Persian court of Fat′h Ali Shah in 1808. 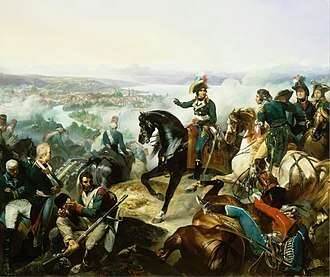 Battle of Ganja, 1826, Franz Roubaud. Part of the collection of the Museum for History, Baku. Storming of Lankaran, January 13th, 1813. Painted by Franz Roubaud. Persia in 1808 according to a British map, before losses to Russia in the north by the 1813 Treaty of Gulistan, and the loss of Herat to Great Britain in 1857 through the Treaty of Paris. Anapa Fortress, taken by Gudovich in 1791. 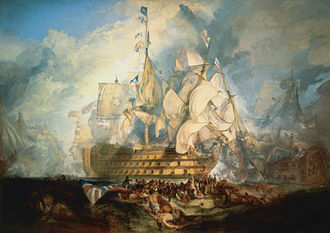 The Battle of Trafalgar by J. M. W. Turner (oil on canvas, 1822–1824). This painting once decorated the Abbas Mirza's palace. 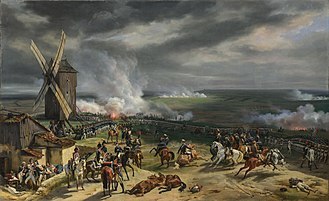 Depicted on this huge canvas is the defeat of the Russian Trinity Infantry Regiment in the battle near Sultanabad, which took place on 13 February 1812. Persian soldiers wearing European uniforms and bearing Persian banners, on which a lion holds a sabre in its paw against a background of the rising sun.